Zapekanka was a great Soviet food – it was filling and could be made from pretty much anything laying around. My second Soviet meal is an important one – the “second” breakfast. Everyone who went through a Soviet school or kindergarten will always remember it. It was often a zapekanka - anything grated and baked with an egg, accompanied by some bread and milk or tea. Exactly as the book says. This time the advice is easily follow-able. 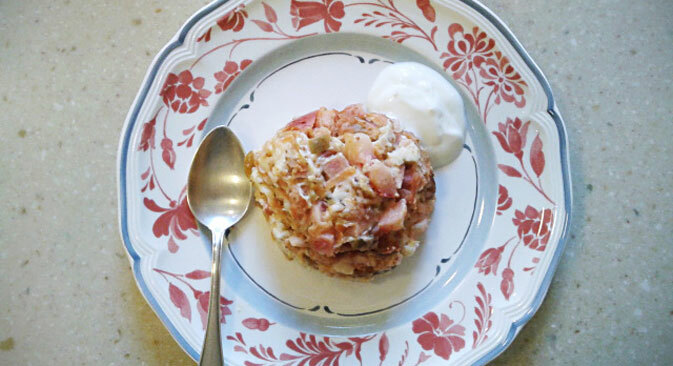 The zapekanka I chose is called "zapekanka with fruit, vegetables and cottage cheese." It sounded fascinatingly weird and nothing like any zapekanka I've ever had. It turns out that the vegetable part is just carrots. The other ingredients are apples, raisins, sugar, spinach and figs. To me figs are an exotic ingredient and I was most surprised when my grandmother said: "Figs? Exotic? No.... we had lots from Armenia & Azerbaijan - white, purple, whatever you wanted." I continued to be surprised when I made the meal and it turned out really nicely. All the ingredients work well together and make a “healthy and tasty” dish indeed. The only thing I find confusing is the lack of specific instructions - for instance, after mixing the ingredients, you're supposed to "bake." At what temperature? For how long? How will you know it's ready? This would not fly on allrecipes.com or a similar source today. Especially since the book is meant to help ‘housewives’ who may not have any experience whatsoever. I was also caught off-guard by "35 grams of carrot" - I held half a carrot in my hand trying to figure out if it was 15, 20 or 35 grams - not the "half a big carrot" I'm used to. Also "add half an egg" made me think for a second. I do remember seeing kitchen scales in quite a few Soviet kitchens, so that might have been the way to go back in the day. Overall I doubt the recipe would be called "user-friendly" by a modern marketing specialist. I really must say something about the significance of zapekanka in Soviet times and in early post-Soviet Russia. In a situation where there was "no food," as my grandmother puts it, you had to use and reuse all the ingredients on hand. Got some boiled rice from the day before and half an apple? Grate the apple, mix it with rice, add some sugar and an egg, and you've got yourself a zapekanka! That's what my great-grandmother used to do. Potatoes, cabbage, pasta all go into zapekanka - almost no ingredient has managed to escape inclusion. I think that's the reason I don't get excited and starry-eyed when my grandmother says she made zapekanka, unlike with the traditional Russian pies called pirozhki. And that's why the recipe from the book seems so far-fetched: not because the ingredients weren't available, but more because if they were good quality they probably wouldn't have been baked. 30g sour cream (1 oz). Had they been, it might have been a whole other story between me and zapekanka. It would probably have been a whole other story for the country, too. I'll make the zapekanka for my grandmother and see if it brings back any memories and will report on it next Friday! 1. Finely chop all vegetables and fruits. 2. Stew carrots with about 10 g water until cooked. Add chopped spinach and stew for 5 minutes, then add chopped apples and figs, 1/2 the egg and mix. 3. Strain cottage cheese, mix with semolina, sugar, the remaining egg and raisins. 4. Grease a baking dish. 5. Alternate layers of cottage cheese and fruit until all ingredient are gone.